Exciting News for 2017: Find Therexapy Information Posted Here! Throughout Michigan since 2008, Agevix Professional Network provides personal trainers certified for and focused on special populations. Recently Agevix co-Founders Todd and Wendy Nienhouse launched a second exercise therapy company, Therexapy. The primary focus of Therexapy is to provide exercise therapy for aging populations and geriatric clients recovering from shoulder, hip, back, knee and ankle repair or replacement. Therexapy communications and working relationships include layers of professionals associated with each client, their families, and supporting health services professionals. 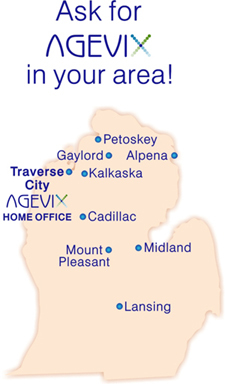 Are you in an area not already receiving Agevix services? Agevix Professional Network founders Todd and Wendy Nienhouse will work to accommodate you. Contact us at 231-590-3830 or info@agevix.com. References and information will promptly be provided.